Milt Hinton, bass; Ossie Johnson, drums. From the opening F major-7 blast of "Music Forever," it is evident this really was music forever. With the two-fisted stride-stomping of Freddie Redd's fleeting jazz-clusters, the slither tongued genius of Howard McGhee's Boperations (surely he seems like a surgeon at work), tenor-man Tina Brooks' never-ending flow of fiery, yet prayerful, gospel/blues shouts, and Osie Johnson and Milt Hinton's almost symbiotic bass and drumming, 35 years later, it's still Hard-Bop at its very best--a classic celebration. The Connection, by Jack Gelber, and directed by Judith Melina, was a play-within-a-play first performed on July 15, 1959 at the avant garde Living Theatre. One flight up the stairs in an old loft building on New York's 14th Street and 6th Avenue district, a "movie-producer" (Jim Dunn), and his two-man camera crew and writer explains to the audience that he has brought together a group of addicts in the pad of a dope peddler (named Leach) to improvise on a dialogue set out by his writer for the filming of a documentary. As the production unfolds, the pusher Leach and the junkies drift strangely about the room waiting for Cowboy, their connection, each in a solo characterization on a common theme, similar to the four jazz musicians onstage among them, whose sessions provide a chilling counterpoint to the happening. The gathering of these desperate lives depicted in expectation of their next "fix" was so realistically thrust upon the audience it became an astonishing, paralysing, and totally frightening experience, one so devastating that in the 1962 London production it set off a near riot. Today it is easy to forget the social innocence and repressive mores of the mid-50s to early 60s, since one day in the life of a "junkie" is so completely overshadowed by modern-day real-life, or TV sensibilities, that it makes the 60s critics calling the play "not for the prudish" even more absurd. 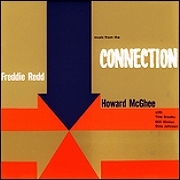 Yet the impact of Freddie Redd's music remains intact. Although each composition contained in the "Connection Suite" was originally explicitly tied to the characters and action of the play, the jazz score has taken on a life of its own. It is jazz that has happily jammed its way through three decades of change, yet still sounds as fresh and exciting as it did on opening night. --ALAN LORBER, from the liner notes.